For those that aren't familiar with it (a fair assumption, since up until yesterday, I wasn't), the Versatile Blogger Award is a traveling honor that goes from blogger to blogger via the magic of the internet. It's meant as a way to pay tribute to those bloggers that have entertained you, taught you something, or that you admire for other reasons. There is no red carpet, there is no nomination ceremony or wild after party held by P. Diddy, but it is a nice gesture to encourage those that you follow. I've covered a lot of what this blog has meant to me during my Obligatory End of 2011 post, so I won't rehash that all here. I would like to add that it is great when you hear from someone that has been following your writing or reading your blog posts when you had no idea they were doing so. 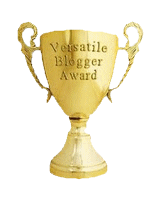 That was the case Monday when Georgina Morales posted that I was one of the five blogs she had chosen to bestow the Versatile Blogger Award upon. Thank and link to the blogger who bestowed the award. Spread the love by passing the award to five other bloggers. So.....Seven random facts about me. I have secret ambitions of becoming an independent filmmaker. Ssshh, don't tell anybody, lol. I am an avid supporter of Open Source Software, such as Blender and LibreOffice. My Gamertag on Xbox live is MAETRIXSS. Feel free to add me! I loathe Country Music....seriously. It's like fingernails on a chalkboard to me. Sometimes the girls in my office put it on Country just to watch me squirm.....yeah, good times, lol. Alright, time to disclose my 5 recipients. Chronicles of Idiocy-This is Erin Berry's site. Erin, Frank , and I all met during a writing contest that none of us won, although the connection between the three of us remains. We are all working towards the same goal (becoming successful authors), taking different paths in different genre's. Erin's chosen genre is Satire, and she already has her first novel available through Amazon, The Chronicles of Idiot. Reading away the Days-Megan has a very active site focusing primarily on Paranormal Young Adult novels. She does a great job of keeping me up to date on which novels I should pick up for my niece, sister in law, and mother (who are all very much fans of the genre). terribleminds.com-Chuck Wendig......that's all I need to say. If you want to get some great writing advice laced with a particularly vulgar sense of humor, this is the place. I own several of his books, and have read a ton of his advice, loving all of it. If you are a writer, you seriously need to check out his site from time to time. Reading Between the Lines-Like Megan, Sahina is from the UK, and has a very active site. She has giveaways, contests, book reviews, and more. She also gave me my first published review for Judgment Cove. Her site is also definitly worth a look. Well, I believe that covers it! Thanks again to Georgina Morales at diaryofawriterinprogress.blogspot.com for thinking of me for this award. Alright everyone, have a great evening (or morning if you are reading this in the AM).